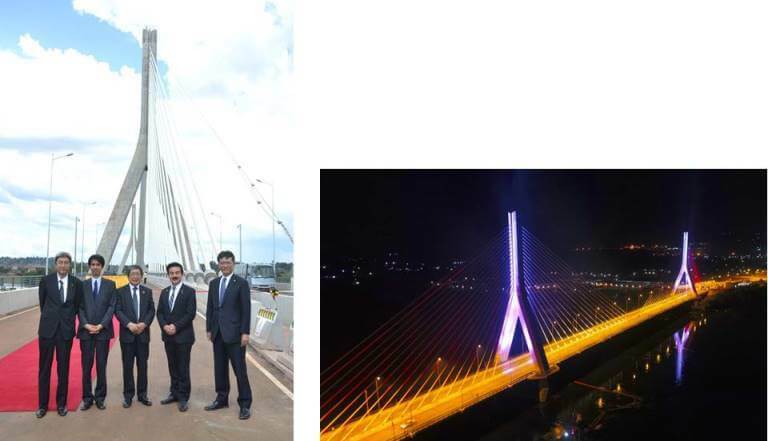 OC Global’s flagship project in East Africa, the Source of the Nile Bridge at Jinja, Uganda, was officially opened in a high-profile ceremony on 17 October by Ugandan President Yoweri Museveni. Other dignitaries in attendance included Japan’s Vice Minister for Foreign Affairs Mr. Masahisa Sato, Ugandan Transport Minister Engr. Monica Ntege, First lady and Education Minister Janet Museveni, Japan’s ambassador Kazuaki Kameda, and JICA’s representative Mr. Yutaka Fukase. OC Global was represented at the ceremony by President Eiji Yonezawa. President Yonezawa played a leading role in the bridge’s design. The 525 m long bridge is said to be the fifth longest cable-stay bridge in Africa. With an 80 km/h speed limit and increased load capacity, the bridge is expected to boost regional trade by improving the link between Mombasa Port and Uganda as well as the onward routes to South Sudan and Democratic Republic of Congo (via Rwanda and Burundi). Large crowds of local people attended the opening with excitement and anticipation. After the opening ceremony, the public were allowed to conduct an historic “first running” across the bridge. Positioned to be a national icon with its striking appearance, the bridge will boost local tourism by becoming a “must-visit” site, according to local officials. Attending the opening ceremony were (from left to right) OC Global’s Eiji Yonezawa, JICA Director Yutaka Fukase, Ambassador Kazuaki Kameda, Vice Minister Masahisa Sato, and Zenitaka Corporation’s Hisayoshi Zenitaka.